Did you know that high performing sales teams are 3.5x more likely to be currently using sales analytics? The amount of data available to sales organizations has grown exponentially in recent years. Amid the data explosion, however, companies have struggled to make sense of it all. Join us for an exclusive webinar featuring SalesChoice and Macadamian Technologies to understand how they use predictive sales analytics to make data-driven decisions that accelerate their revenue growth and win rates. See why 74% of sales leaders are using or will be using sales analytics in the next 18 months. Julien Sauvage, Salesforce. Dr. Cindy Gordon, SalesChoice. Dinesh Kandanchatha, Macadamian Technologies. Derek Cooling, Irving Oil. Kristie Knox, Weatherford. Martin Leach, Salesforce. Oil and Gas is a competitive business: commodity pricing, seasonal demand, supply availability, inventory costs, and delivery logistics can reduce margins to fractional cents. Join us on July 26th at 11:00 PST for a special webinar featuring Derek Cooling, Irving Oil, and Kristie Knox, Weatherford, as they share how they've digitally transformed their businesses to respond to industry challenges. You will walk away with actionable ideas you can start using to start transforming employee engagement at your company to win the war for talent today. Victor Ng, CEO, EXOCLOUD. Marc Gaudett, Account Executive, Salesforce. Omar Zaibak, Marketing Manager, Salesforce. Technology has changed the game for small businesses. For decades, being “the little guy” has been a disadvantage, but not anymore. The right technology can turn an SMB from a niche player in an industry to a major threat to established enterprise players. Join us for a special webinar featuring Canada-based EXOCLOUD to learn how they’ve quickly grown their business by finding, winning, and keeping more customers with Salesforce. Omar Zaibak, Salesforce. Mike Bogan, Traction on Demand. Serge Rose, ALDO Group. The retail industry has gone through a massive transformation driven by changing consumer behaviors, new channels, and emerging technologies. According to Forrester, most retailers now cite mobile and omni-channel efforts as their two top priorities. Retailers must ensure that in-store and digital channels are supported and integrated with each other to ensure a consistent customer experience and stay relevant in an increasingly competitive landscape. Join us for a special webinar featuring ALDO to understand how they’ve approached integrating the Salesforce platform into their business and how they’re looking to develop their own omni-channel strategies that keep the customer experience at the center of everything they do. In today’s competitive world, companies are constantly trying to find ways to gain an ‘edge’. What’s encouraging is that companies need not look further than the walls, or virtual walls, of their own organization, particularly their sales and marketing departments. Join us for a special webinar and live demo on April 14 at 11:00am (ET) and get an exclusive peek inside Salesforce. 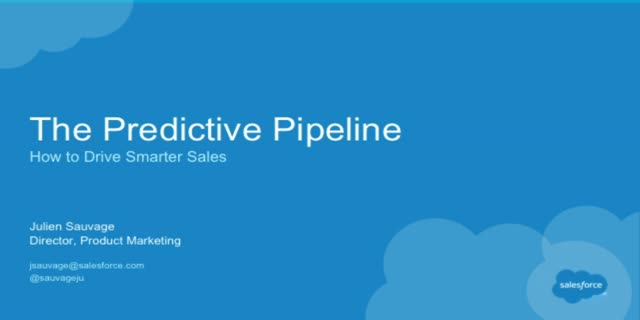 Learn how Salesforce is using their own cloud-based products, increasing the productivity of their sales and marketing teams, and improving the performance of their own business. Today's world is complex. Multiple stakeholders, manual processes, disconnected systems. You already have Salesforce to help you. But, do you want to amplify your Salesforce investment? With DocuSign for Salesforce you can further streamline your sales processes. By implementing digital transaction management, you will further reduce the cost of every transaction and interaction in your organization - and have more time for the valuable activities, like spending time with customers. Join Salesforce, DocuSign and Traction on Demand on March 3rd @ 11am ET to find out how companies are leveraging DocuSign for Salesforce and you can accelerate sales growth and reduce costs in your own organization. If you are a Canadian organization or have Canadian customers with whom you communicate electronically, you are undoubtedly familiar with Canada’s newest Anti-Spam Law (CASL) that was brought into effect July 1, 2014. But, are you comfortable with the legislation and do you know how your organization’s practices need to adapt to be compliant? The hospitality industry is nothing short of ruthless. With about 40% of restaurants declaring bankruptcy in their first few years of operation, those who supply and service the industry can expect a wild ride. Enter TouchBistro. This Toronto based startup has become a global leader, providing an iPad point-of-sale solution to cafes and restaurants around the world. In just three short years, and despite industry economics, TouchBistro now boasts a customer base of thousands and has emerged to become the top-grossing Food and Beverage app in 28 countries. What would you do if you scored a backstage pass to the hottest concert of the year, got to walk down the infamous Oscar red carpet, or sat on the 50-yard line of the Superbowl? Well, if you are Ross Video, you make sure that the billions of viewers around the world get an equally amazing experience. Learn how this 40 year old company with humble beginnings has grown into a technology powerhouse and a dominant force, manufacturing innovative technology used in live production by the largest television stations, sports stadiums and live events around the globe. In this webinar, Sheldon Speers, Director of Sales Operations at Ross Video, will tell you how they, despite their size, have emerged to become to a major disruptor, delivering real time business insight to a network of globally connected employees, allowing them to successfully compete with industry giants. They come a long way already, yet for Ross Video, the first 40 years were just the beginning. Think the only way to get an amazing NHL hockey experience is with your face pressed up against the glass when the puck drops? Well, yes, this is a pretty memorable moment, but the Ottawa Senators Hockey Club will tell you that connecting with their hockey fans goes well beyond the stadium experience. The Ottawa Senators Hockey Club is changing the way that hockey fans interact with Canada’s favourite sport. Come hear about how the Ottawa Senators Hockey Club is re-inventing how they support their fans with mobile and social technologies and how they are creating memorable “fan moments” with a truly customer centric approach. Canadian Innovators is a series of webinars that showcase Canadian success stories - all who are leveraging the power of the Salesforce1 platform. Presented by: Julien Sauvage, Salesforce. Dr. Cindy Gordon, SalesChoice. Dinesh Kandanchatha, Macadamian Technologies.